Many city neighborhoods are missing teeth. Where homes, shops, and schools once stood, only honeysuckle and weeds remain. But lurking beneath the surface…the unknown. The old buildings might still exist below ground. Sometimes homes were collapsed into the foundations and then covered with dirt. This is less than ideal, and worse if you don’t know it before you start construction. In our case, it appears the previous home’s foundation is still there, at least partially. Test pit dug on site. Civil and Environmental Consultants brought Hoosier Drilling on site Wednesday to extract soil samples. The they used is a Standard Penetration Test. First a large hollow ‘drill bit’ is rotated into the ground. At intervals, additional drill bits are added as the auger goes deeper. 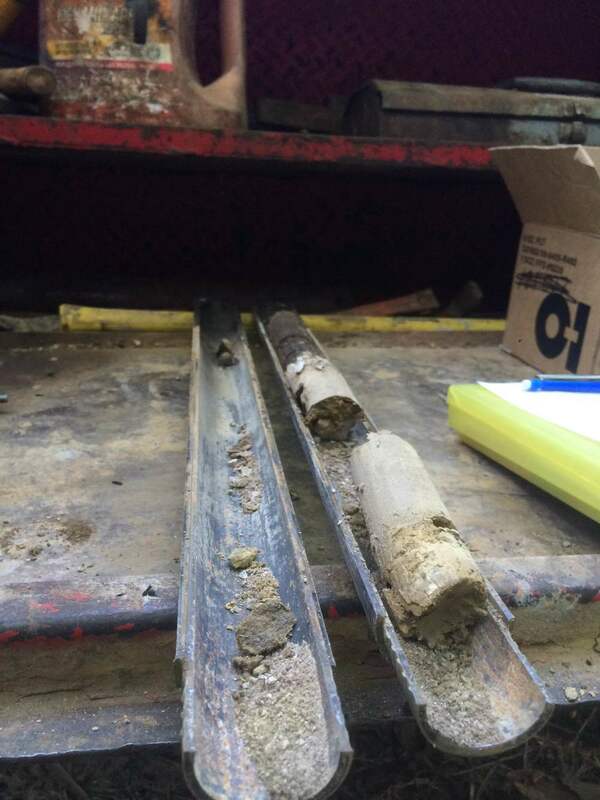 Intermittently, a hardened metal tube with a 1.375″ opening is driven into the borehole (inside the hollow drill bit) in 18″ increments by a 140 pound weight dropped from 30″. This provides two pieces of information. One is the soil sample itself, extracted and cataloged in incremental depths, will be analyzed in a lab. Secondly, the number of ‘hammer’ strikes to get the tube down 18″ can provide information about the density of the soil. Drill rig’s ‘hammer’ and drill system. The soil analysis will inform the foundation design and retaining wall design. Even though the homes will be small, the homes will be built on a hillside. Doing things right from the beginning will ensure long term stability and limit soil movement because of proper design. A lot of tiny houses move on wheels, we want these to stay put.